ring it’s first three years under Ms. Gazda, the organization expanded and grew from one thirty member orchestra to two orchestras and 100 students. In 1993 William Hollin became the second Music Director of the Potomac Valley Youth Orchestra. 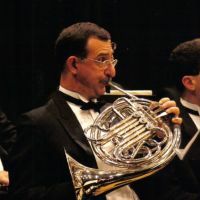 Under his leadership, the program grew to include four large orchestras, a wind ensemble, a flute choir, a clarinet choir, and chamber music program. Now, after thirteen years, there are more than 350 students participating each year. In 2002, the organization expanded again adding several new programs, including a chamber music program, clarinet choir, theory and composition classes, and a concerto competition, the winners of which perform with one of the senior orchestras. Also in the 2002-2003 season, the Potomac Valley Youth Orchestra embarked on its first international tour, performing in Norway, Denmark and Sweden. The PVYO continues to provide young musicians the opportunity to develop personally and grow musically with new challenges and exciting new programs. PVYO is a non-profit organization, formed to give serious young musicians an opportunity to explore the art of classical orchestral playing.